As of October 2017, Horsefly History Tours takes you back to Durango's early, rowdier, days. What once was the Palace Hotel is now a popular restaurant downtown. Laine Johnson guides two walking tours downtown, illuminating the town's rich history with stories of shootouts, soiled doves and murder. 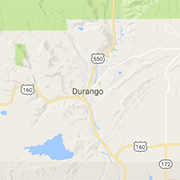 A few months before Lakota Sioux Chief Sitting Bull surrendered to the US army, Durango was founded as an official town on a blustery April day in 1881. Brought by the train, miners and ranchers flocked in droves where the Ute tribes used to roam free. Like most pioneers at the time, they were immigrants seeking fortune in the wild, wild West. And an unruly West it was back in those dusty bygone days, says Colorado-native, Laine Johnson, founder and guide for Horsefly History Tours. With a background in wildlife biology that granted her an adventurous past tagging mountain lions in Wyoming and researching martens in Southwest Alaska, Johnson has always had a passion for uncovering the stories behind wild places. The former teacher decided it was time to bring her zest for "history with a bite" to the streets of Durango. As of October 2017, Johnson has rolled out two afternoon walking tours that can be booked through her sleek, gorgeous website that's a treat to visit in its own right. The first 1.5-hour tour option sticks to the roof of your mouth at the thought of it: Coal Dust & Oysters. Participants meet Johnson in front of The Palace Restaurant and Train Depot on the south end of town, which used to be the Italian District. It was here that first-timers would step off of the train into the coal-thick air smelling of the smelter just west of the station. Without spoiling any surprises, Johnson has crafted a storytelling adventure that leads listeners to six different spots around South Main Avenue and up to East Third Avenue. At each stop, Johnson brings to life the works of local historians, like Duane Smith, Kay Niemann and Esther Greenfield, who she considers advisors of Horsefly History. Along the way, you’ll hear rousing tales about gunfights, oysters on the half shell, gritty characters, like Chained Lightning, and brothels with scandalous names, like the Hanging Gardens of Babylon and Monkey Hall. A highlight of the tour, you’ll match historical photos (compiled in nifty booklets handed out by Johnson) with modern-day scenes around town to see, firsthand, the change Durango has undergone over the years. The tour wraps up with a tragic love story that'll leave you wanting a drink, and just in time. Four Leaves Winery serves as the grand finale for Coal Dust & Oysters with samples of fruit wine, much like the libations sipped by the soiled doves of the turn of the 20th century (in their line of work, hard liquor was never a good idea). The second Horsefly History tour explores the north side of Main Avenue, starting at El Moro Spirits and Tavern. With the theme of Murder & Mayhem, curious amblers are swept into chronicles of a beloved doctor with a harrowing mistake looming over him. Johnson also shares legends of secret opium dens, notorious saloon keepers and the "fallen angels" who worked in brothels on both sides of the railroad tracks. Murder & Mayhem ends at Durango Craft Spirits where you're invited to raise a glass to this kind of history not repeating itself. A descendant herself of Italian immigrants, Johnson has the gumption to reveal the seedier side of Durango's fascinating past. Johnson and her husband, Jesse, moved to Durango in 2005 and couldn't be more excited to raise their eight-year-old daughter, Evelyn (Johnson's "honorary business partner"), and six-year-old son, Grey, here—despite the town’s sordid history. "Old buildings and places speak to my soul," writes Johnson on her website. "I have always had a firm belief that a connection to place, whether a town or a forest, feeds our souls. "Reserve your spot today, and make sure to check out both distinctive tours (limited to 10 participants). Tours are available upon request from now until March, with regularly-scheduled tours kicking off in late Spring.